Start with 15 dots in the center and stop at 8 by putting interlaced dots at both sides. Thank you for visiting my site and your comments. It is a good suggestion to show how to form the kolam. I will do it. Thank you for visiting my site. 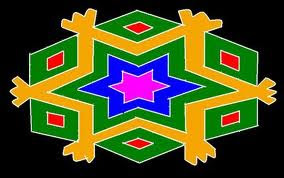 I have posted the step by step drawing of this kolam as above. Hope you can draw this kolam now.